Item305 - Perth 18O. Plan, part of Perth showing Convict Depot under Mt Eliza by William Phelps, Fieldbook 1, dated 1858. (Corrected 12/7/1864). [scale: 2 chains to an inch, Tally No. 005766]. Item306 - Perth 18P. Plan of Perth Town Lots Numbers T15-24 bounded by Waterloo & Nelson Crescents & Nile & Hay Streets. (RI Church of England Cemetery T26/T27 noted) by J. L. A. Ley, Surveyor 11/5/1870 (No Fieldbook). [scale: 3 chains to inch, Tally No. 005768]. Item307 - Perth 18Q. Plan showing part of Section L in Perth Townsite between St Georges Terrace & Bazaar Street. [scale: 1 chain to an inch, Tally No. 005769]. Item308 - Perth 18R. 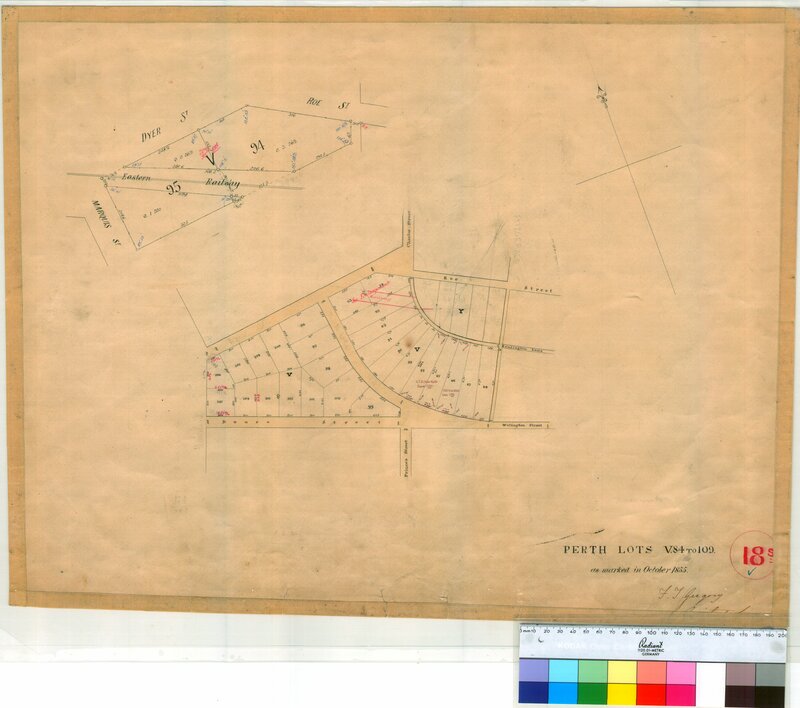 Copy of Plan 18I showing Suburban Lots 126-138 in Perth Townsite by W. Phelps, 1859 - See Plan 18I for details. Item309 - Perth 18S. Plan of Perth Townsite showing Lots V84-109 as marked in October 1855 by F.T. Gregory [scale: 3 chains to an inch, Tally No. 005770]. Item310 - Perth 18S1. Plan of Perth Townsite, continuation of Hutt Street to Brisbane Street by A.C. Gregory, June 1854. [scale: 3 chains to an inch, Tally No. 005771]. Item311 - Perth 18T. Plan of Public Highway between Moore & Water Streets in Perth Townsite by A.C. Gregory, June 1854. [scale: 1 chain to an inch Tally No. 005772]. Item312 - Perth 18U. Plan of part Perth Townsite showing part of Section L, Lots 1-10 by William Street, Barrack Street, St George's Terrace & Bazaar Street (unsigned & undated). [scale: 1 chain to an inch, Tally No. 005773]. Item313 - Perth 18V. Plan of part of Perth Townsite showing Lots 17-27, V110, 109-112 & sub. 61 (vicinity of Sutherland Street) by Charles Evans. [scale: 2 chains to an inch, Tally No. 005774]. Item 309 - Perth 18S. Plan of Perth Townsite showing Lots V84-109 as marked in October 1855 by F.T. Gregory [scale: 3 chains to an inch, Tally No. 005770]. Perth 18S. Plan of Perth Townsite showing Lots V84-109 as marked in October 1855 by F.T. Gregory [scale: 3 chains to an inch, Tally No. 005770]. Confirm Item Request: Perth 18S. Plan of Perth Townsite showing Lots V84-109 as marked in October 1855 by F.T. Gregory [scale: 3 chains to an inch, Tally No. 005770].